Gas logs are the primary component of your gas fireplace. They are used in both vented and unvented gas systems. A gas log set doesn’t overheat the room or require any change in the appearance or structure of your fireplace. Instead it delivers a realistic, room-enhancing fire, at any moment, any day of the year. When selecting your gas log set, be sure to check that it conforms with the local codes. Some areas of the country require different standards, both in the type of gas appliance, as well as the placement of the unit. It is your responsibility to make sure that your gas fireplace conforms to these codes. Ourdoor Gas Firplace with gas logs. There are a wide range of logs available such as birch, oak and split wood. By using a metal pan and sand to disperse the gas, they are able to create a flame that more closely resembles a wood-burning flame. When in use, the damper of your chimney needs to be open. As well, a sand pan burner log set creates an abundance of black carbon residue on the logs and inside the firebox which again makes the entire fire experience more closely resemble a wood-burning fireplace. 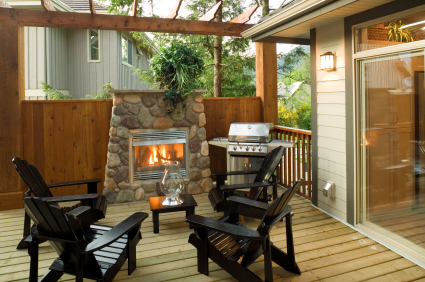 You get the the appearance of a wood-burning fire with the efficiency of a gas-burning system.